Some cats can be picky about where they do their business. Sometimes, this leads to unwanted bathroom behaviors with cats. If their bathroom is not set up perfectly, they aren't going to use it. I saw a lot of these issues while working as a veterinary technician. There are a few tips cat parents can follow to help keep their feline friends happy. Always have one more litter box than you do cats. If you have too many cats for this, just work hard to keep your boxes clean. Some cats won't go in boxes that have hoods. Try removing any hoods or litter box covers. Keep the litter box out of high traffic areas. Some cats enjoy a little privacy while they are going to the bathroom. Try a plain, unscented litter. Some cats don't like certain scents and won't use scented litters. 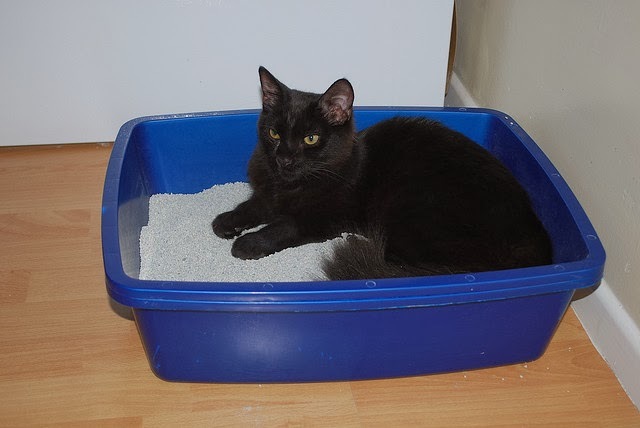 Keep your litter box clean and empty it regularly! It infuses regular litter with "good bugs" that help eliminate harmful bacteria found in litter boxes. These good bugs are not only good for your nose, but for your health and your cat's health as well. Litterbiotic works by eliminating the source of bad odors, not just masking them with scents. Litterbiotic is made from naturally sourced ingredients. Not chemicals that are produced in a factory. And it shouldn't deter your cat from wanting to use their litter box. Just add the product to your regular litter and your cat shouldn't notice. I unfortunately have no way to test out this product myself, but think the concept of Litterbiotic makes complete sense which is why I wanted to share it here. No one wants gross bacteria hanging around in their house. It's unhealthy and stinky! Visit the Litterbiotic Cat Litter Deodorizer website for more information. If you'd like to purchase Litterbiotic, we have some discount codes for you! When you purchase a year's supply of Litterbiotic with our special discount code, you can get 4 months free! One pouch of Litterbiotic is equal to a month's supply. The discount codes for this special offer are listed below. These codes are valid through the month of November. 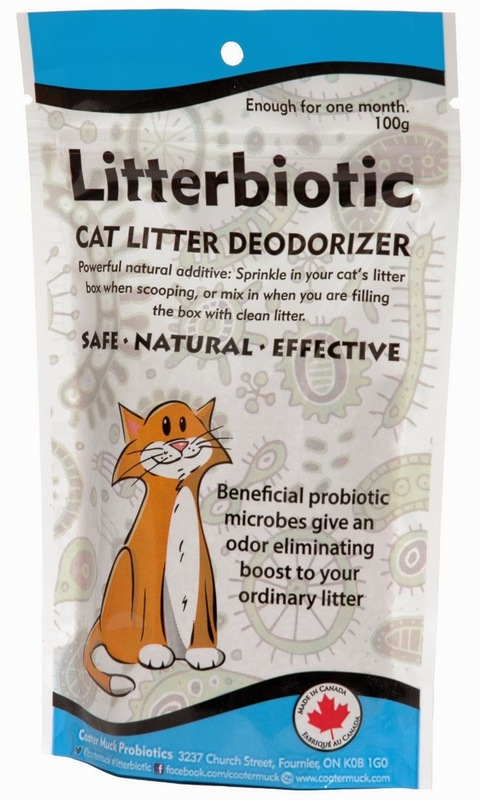 Purchase Litterbiotic Cat Litter Deodorizer! 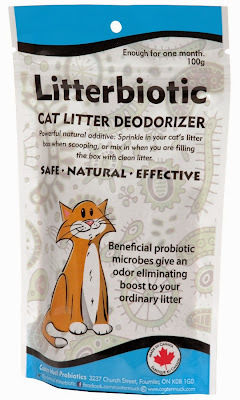 On top of this awesome deal that Litterbiotic has offered Pawsitively Pets' readers, they are also offering you a chance to win some of their litter box deodorizer with a giveaway! One lucky person will win a year's supply of Litterbiotic Cat Litter Deodorizer (12 pouches total). Another person will win a 3 month's supply of Litterbiotic (3 pouches total). This giveaway is open to residents of the US and Canada. The giveaway starts now and will end on November 17th at midnight CST. There are many ways to enter the giveaway, so choose whichever options suit you in the Rafflecopter form. And as usual, if you have any questions or don't know how to enter please email me at annstaub(at)yahoo(dot)com. Good luck! 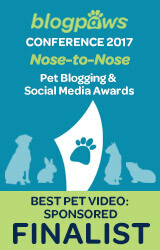 Be sure to stop by Litterbiotic's Facebook Page and say hello! Disclosure: I received no compensation or free products in exchange for this post. 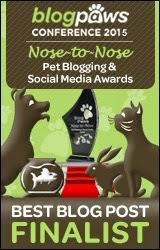 I am simply sharing a product I think will interest Pawsitively Pets' readers. Litterbiotic is offering the prizes mentioned in this post and Pawsitively Pets is not responsible for shipment of prize. This post does contain affiliate links. Lol... oh well. My old KKMM used to go outside too most of the time. Have a tremendous Thursday Ann. We have two cats, one covered litter box, but the Aldi cat litter - it is the best and inexpensive, and we have a critterzone. Nothing smelly here anymore and that is coming from a hound, but it took years before we found this happy mix! This product sounds interesting, but don't need it right now. Still nice to hear about these things. Glad you were able to find something that works well for you Emma! Good advice. I'm an only cat, so the litter box isn't much of an issue here. Smells so good it's good enough to sleep in! Sounds great. Litterbiotic sounds intriguing! Thanks for sharing, and for having a giveaway! I have two cats and they both use the same litter box. Every now and then my male drops a real sink bomb & I think this product would be a great defense to try. Thanks! Our elderly cat will only use the litter box some of the time. We have tried everything you suggested, with no luck! We're not sure what his issue is (he's been checked out by vet), other than being old and lazy! Yea, sometimes it's just plain hard to find the answer! That is quiteintweresting and we sure didn't know about it! TW is curious even though my poos are odorless. Pop is the big stinker. We try to use unscented litter cos both TW and I have asthma. Those sound so cool. Am gonna share this with my sister for her cats too! Cool - good luck to you and her! Litterbiotic sounds like a good product/idea. With multiple cats in the house like I have I'm sure it would help. I do clean all boxes (faithfully) t!wice a day (and sometimes more if needed), so do a good job there, but could still always use a little help. That is a lot of cleaning! But I guess it's inevitable with a full house of cats. I can't join again. Meow! Good luck to the winners. Sorry Sushi. I'm having a Thanksgiving Photo Contest that all friends can join right now so I'd love to have you! Hope things are OK in the Phillipines. I want to try this because my litterbox is up a spiral staircase and odors travel in my house. My house is open because it is a chalet. Anything that would help with a stinky litterbox is a plus for me! I would love to try this for my "Bathroom". 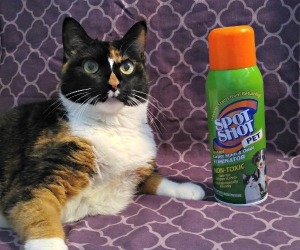 My Furless Mom has tried everything to help with the stinky and this product seems like a great idea! Signed, Flossie. My Mom says thanks for the giveaway! Hi Flossie, good luck to you and your mom! My two kitties and I need it! I have two new senior rescue kitties that came with a supply of litter, which I hate, so I'm going to switch them over once I start running out. In the meantime, their litterbox stinks, even though I scoop and deodorize every day. It's disgusting!! Sounds like Litterbiotic could come in handy for you! Good luck! I hope so! Good luck to you! My Angel and Heaven are 2 smelly girls. I would love for them to try this. Good luck to your kitty pals Ruckus! I currently use A&H litter box deodorizer but this product in the review is made from natural ingredients and most importantly, no chemicals so I'd love to try it! big kitties make big odors!